For fast acquisition of targets and an easy use sighting system, you can’t beat a red dot sight. These types of sights feature an illuminated “red dot” that functions as an accurate aim point for the operator. A red dot sight is primarily meant for targets within 100 yards, but it can also work for longer ranges. The red dot sight is often known as a reflex sight, which is a term stemming from the fact that red dots rely on non-magnifying reflectors to display the red dot. Basically, a small LED generates a colored dot of light, which reflects against a small spherical mirror. The mirror focuses the dot on a lens, which is what you see when you look through the sight. On more advanced (and expensive) red dot sights, additional lenses may be added to the setup to eliminate “parallax”. What is parallax? It refers to changes in the position of the dot when you look at it from different angles. For example – you put your gun in a vise with the red-dot sighted right on your target’s bulls-eye. When if you move your head to a different angle and look through the sight, is the dot still on the bulls-eye? Hopefully, the answer is yes – that means that your red dot is “parallax-free”. This enhances the overall accuracy and usability of the sight. But be prepared to pay a little extra for a truly parallax-free sight! Red Dot Sights come in many shapes and sizes. “Tube” style sights look a lot like a scope, while “open” style sights are more of a square shape (Eotech red dot sights are a good example of this). 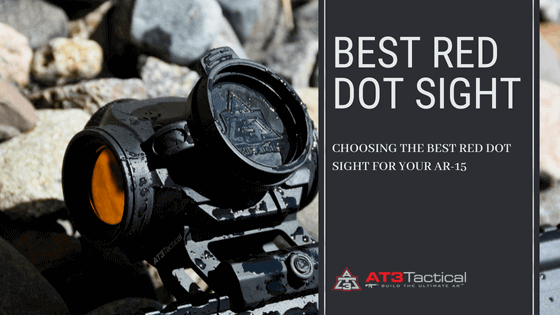 The dot size, dot pattern, and dot color are some of the important considerations in choosing the right red-dot sight for you. You are the operator so your eyes, usage, the mission package and the configuration of your AR-15 would come into play in choosing your red dot sight. The dot size should be big enough for you to easily see, but not too large to obscure targets. Dot size is typically measured in MOA (“minutes of angle”). Essentially, 1 MOA means roughly 1″ at 100 yards. So if you have a 5 MOA dot, that means this dot covers a 5″ area on a target 100 yards away. For a general use AR-15 sight, we recommend MOA between 1 and 4 MOA. Anything larger than 4 MOA will just get in the way. The dot pattern (AKA the reticle) is largely personal preference. Most sights have a dot (hence the name red dot), but you can also get reticles shaped like crosshairs, or many other patterns. Some sights have adjustable reticles and allow you to quickly switch between different reticle styles. The last main choice is the color of the dot. Wait – it’s a red dot sight so the dot is going to be red, right? Not necessarily – green and blue are also available. From our experience, red is the best all-around color, but blue can be easier to see in certain bright-light conditions. It’s best to try a couple of different sights and see what you prefer. For a sight that works well on shorter-range shooting (less than 300 yards), the red dot sight can be a great choice. They typically weigh less than a scope and are much better for quick target acquisition. Also, there will be no “tube effect” that is typical with a scope (due to the varying eye relief on scopes). Basically, a red dot is much simpler to use but lacks the magnification of a scope. There are many choices available for red dots, and everyone seems to have an opinion on the best red dot sight for AR15. But we have 3 categories of recommendations: Best Value, Best Overall, and Other Excellent Red Dot Sights. Looking for a great red dot sight on a budget? AT3 red dot sights are the place to start, with 2 popular models to choose from. At a price under $100, the AT3 RD-50 PRO Red Dot Sight is an unbeatable value. It’s tough, lightweight, accurate, and easy to use. The RD-50 PRO features a crisp 2 MOA dot, a lightweight riser with several height configurations, and an armored housing with integrated lens caps. Other key features are a waterproof, shockproof design; crystal-clear multi-coated lenses; and up to 50,000 hr of battery life. Plus, all AT3 products are backed by a transferable Lifetime Warranty. Included with the RD-50 PRO is the new PRO-MOUNT Riser – a premium lightweight riser mount that serves as the perfect companion for any AR-15. There are 2 mounts heights available – a medium .83″ riser for “absolute” cowitness with AR iron sights, and a 1″ high riser for lower 1/3 cowitness. In addition, the RD-50 PRO includes RD-ARMOR – a cover with integrated lens caps that protects your red dot sight from scratches, dust, and moisture. If you want a red dot sight that is lightweight, dependable, accurate – at a price that won’t break the bank, you can’t go wrong with the the AT3 RD-50 PRO. The AT3 LEOS Red Dot Sight is designed for the AR-15 rifle and is packed with features like red targeting laser, integrated riser mount, flip up lens caps, and tool-free windage & elevation adjustment. The both the laser and red dot are controlled with easy push-button controls. Just like the RD-50-PRO, it features up to 50,000 hr battery life, and a durable, waterproof, and shock resistant design that unfailingly stays on target. For an accurate, dependable AR-15 red dot sight that’s packed with features, the AT3 LEOS can’t be beaten. EOTech is a premier manufacturer of Holographic Red Dot Sights that allow heads-up, 2-eyes-open shooting. EOTech red dot sights come in many different styles and reticles, some of which are made for specific calibers like .223, .308, and .300 Blackout. This chart compares some of the most popular red dot sight models on the key attributes of price, battery life, dot size, and weight. Thanks, you make doing research easy. Can’t wait to receive my free U.S. Army manual for M4/M16/AR15. Love your articles on various AR gear/parts/pieces! Really it comes down to your check book and you own personal likes. Was at the range recently and asked a friend on the AZ DPS SWAT team about red dot sights and which one he had on his rifle. He said the AZ DPS SWAT team recently dumped the Aimpoint Pro Patrol and went to the Trijicon MRO because the Aimpoint simply wouldn’t hold up (both under $500). He had high praise for other higher priced Aimpoint products such as the COMPM4 (as do I, used one in Afghanistan) but everyone has a budget. No mention of EOtech one way or the other. Do you have any experience with or have heard about DI Optics RV 2? I’ve owned an eotech exps2-0 sight for 3 years and I’ve never had the slightest problem, and I don’t exactly treat my guns and gear gingerly. I don’t live in a place where it gets down to -40 degrees Fahrenheit, so iv never seen the problem that they were recalled for. Just my two cents. Currently running a Holosun (HS403GL) on a DDm4 V7 and so far it seems to be a great little optic for right at $200. I purchased your product for my AR Platform a while back and am extremely satisfied. Thank you for reaching out to us, Bobby! I highly recommend our RD-50. It’s our best seller for a lot of good reasons. It’s low cost but high quality, with a lifetime warranty to back it up. Ruger PC 9 seems to be getting more popular these days. Since it has an atypical sight profile, you will have to use the Yankee Hill Machine YHM-230 .3″ riser with the RD-50. Doing so will give you an absolute cowitness. We do not have this riser listed in our website but we have them in stock, in order to accommodate customers like you. Let me know if you are interested in this riser and I can email you a personalized quotation for it. Hello, Robert! The mini-14 is a little different. The front sight post is a little shorter than a standard AR-15 sight, so the RD-50 with no riser should yield an absolute cowitness. As for your astigmatism, let us know how the red dot works for you. If you encounter any problems, just reach out to us and we’ll try our best to assist you. Would your company recommend the RD or the LEOS for an AR-15 red dot? I understand both will fit, Just wanted to get your opinion before buying one.